Received this product and tested my tank. I was wondering why corals didn't have the luster/color that were at the LFS. After the LONG times time (yes, takes about 15-20 to run this test and my only complaint) I found out that my strontium was at 3. Once that was known, I added a strontium additive and 2 days later, the corals coloration started to return to what I remember from the LFS. The test does work and I am sure it isn't as accurate as an ICP test, but it is good enough for a home kit to get a close enough number to where the aquarium parameters are. Over the past couple of months, I've purchased and evaluated most of the hobbyist-level marine test kits from Red Sea, Salifert, Elos, Hanna, Nyos, SeaChem, Giesemann, Lamotte, and Hach, and then compared them to results from simultaneous water samples sent to Triton Labs for spectroscopy. There is NO accurate hobbyist level test for strontium. Both this test and the one from SeaChem both routinely read 0 or a low level even when the test is performed correctly, although simultaneous samples sent to Triton labs give a toxic levels of 20 or higher. (Note that both other reviewers of this product got readings of zero - The test always gives a reading of zero!) Continuing to add supplements on the mistaken impression that you need more, based on this test, can easily lead to overdosage. Strontium in m tank was not readable. My corals paid the price by flesh separation from it's skeleton. I started dosing the product Brightwell markets and over the period of a week I can see a difference starting to occur. This test kit takes time to use but well worth the price and time. Love this kit. Started testing for and dosing strontium about a year ago after a conversation with a LFS owner. 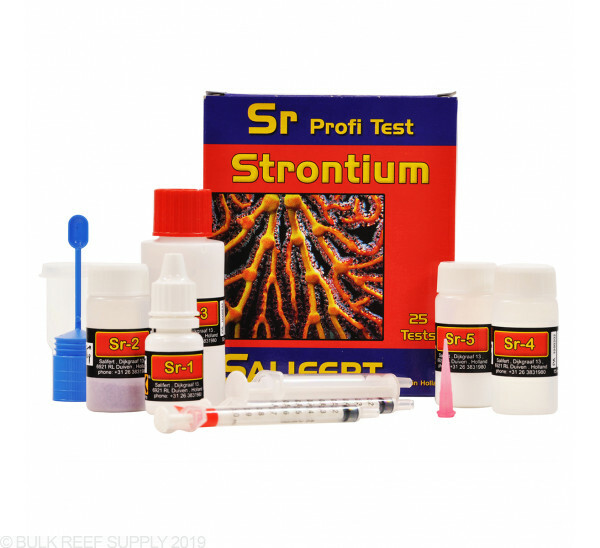 The first test kit I bought was the Seachem Strontium kit. The directions were absolutely incomprehensible and the packaging was a nightmare. Seriously, I took a full year of college chemistry with labs and still had absolutely no idea where to start with the instructions. So I was a bit discouraged. Found this Salifert one while searching the internet, and it is so much more useable. It does take time, plan on a good half hour. But it does work. The first time I tested two of my tanks I got 0ppm. So I started adding strontium. My stonies started growing like crazy, calcium consumpion doubled, and the green marbled mushrooms that had just never done very well suddenly colored up and started spreading. They had spent a year being three little muddy colored mushrooms existing on the substrate. They had quickly returned to the beautiful mint green they had been when purchased and they were rapidly spreading up the rock. Now there are easily about forty of them. I currently have the dosing dialed in pretty well and only test about every six weeks. One note on Sr dosing: at least in my case it has hugely reduced the need for added magnesium, so be careful to check both frequently at first to avoid overdosing Mg.